"The Hobbit" - which acts as a prequel to the events of "The Lord of the Rings" - had a more arduous trek to the big screen than Frodo did to Mordor (and as we know, one does not simply walk into Mordor). Original director Guillermo Del Toro ("Hellboy"), working under the watchful eye of "Rings" mastermind Peter Jackson, had to drop out, and Jackson himself was forced to step in and return full time to Middle Earth. Now that we have our first look at part one of the story (Jackson has divided J.R.R. Tolkien's novel into two movies), called "An Unexpected Journey," we have to say - Welcome back, Pete! "The Hobbit" retains the look and feel (and several cast members) of "Lord of the Rings," and that sense of continuity will certainly serve it well. So what awaits us upon our return to the Shire? Let's see.. The Shire. The idyllic home of the Hobbit race. Here, we see old, gray-haired Bilbo Baggins greeting his nephew, Frodo (a returning Elijah Wood). Clearly this is a "present day" set-up around the time of "LOTR" before we flash back to the earlier events covered in "The Hobbit." …before we see our first glimpse of series newcomer Martin Freeman (from the UK's "The Office") as young Bilbo. As if anyone else could even dream of playing the wise wizard Gandalf the Grey, we are once again treated to the sight of Sir Ian McKellen in his beard and hat. "Wizard! You shall not pass…on this role!" Fili, one of the youngest of the thirteen Dwarfs, is known for having keen eyes and is used as a scout. This is Kili, who is Fili's brother. You will find that, even though Tolkien was a genius who invented entire languages, he only bothered to come up with three name variations. This one is called Oin. And Oin's brother, Gloin. If that name rings a bell, give yourself a hand. You recall that Gimil - the Dwarf member of the Fellowship of the Ring - is introduced as "Gimli, son of Gloin." Yep, this is his dad. And Oin is his uncle. This is Dwalin who, by Dwarf standards, is a big dude. He's the first to arrive at Bilbo's house. This is Balin, Dwalin's older brother. Confused yet? They call this guy Bifur. He has two brothers in the crew. Guess their names. …and Bombur, congratulations. You are a Tolkien name-generator. This jolly mead-enthusiast is Dori. He plays a mad flute. This is Dori's brother Nori. This movie better come with one of those reference guides that come with Whitman's chocolates. This is Ori, brother of Dori and Nori. Stop snickering. And finally, the leader of the gang - Thorin Oakenshield. He is descended from Dwarf Kings, and tries his best to toughen up his peoples' image (he does a good job of that). He's not pleased, however, to be saddled with a peacenik Hobbit on his quest to reclaim Dwarf honor (and gold). Jackson left out a lot of Tolkien's "Lord of the Rings" musical interludes (the ones that remain are kind of awkward), but here he seems intent on including the Dwarfs' mournful "Misty Mountains" dirge (we glimpse Thorin leading his men in the song) which lays out where they're going and why. Clearly they're saving"The Ballad of Bilbo Baggins" for the end credits. Bilbo happens upon another familiar "Lord of the Rings" touchstone - the shards of the sword Narsil. The sword was used by the human king Isildur to cut the ring from the finger of Sauron and later reforged and given to Aragorn (who finally accepted his rightful place on the throne of Gondor at the end of last LOTR installment "The Return of the King"). Yes, that's Cate Blanchett returning as the Elf Queen Galadriel, who aided Frodo and the Fellowship on their quest to destroy the ring. Here, she seems to share a tender moment with Gandalf. Perhaps Aragorn isn't the only Middle Earther to "go Elf." ("One you go Elf, you're never yourself," I believe the saying goes). If the shards of Narsil didn't already tip you off, the Dwarfs arrive at the Elf kingdom of Rivendell, the place where the Fellowship began. Although he's not shown, we can be pretty certain this means that Hugo Weaving will return as Elf King Elrond. We see an armed and wary Gandalf getting smacked down by…whom? We think this is Radagast the Brown, a fellow wizard (of the group known as the Istari, for you pub quiz enthusiasts) known for being "close to nature." Which is why he looks homeless. He lives in the dark forests of Mirkwood, which is teeming with evil. It's tough to make out here, but the Dwarfs are fighting three giant trolls in this scene. This is significant if you watched the extended version of "The Fellowship of the Ring" - during the scene immediately after Frodo gets stabbed by one of the Nasgul, he wakes up and you see three giant trolls made of stone in the trees behind him (the scene was cut out of the theatrical release). These are those three trolls, who get turned to stone after Gandalf tricks them into arguing until the sun comes up. Oh, right. 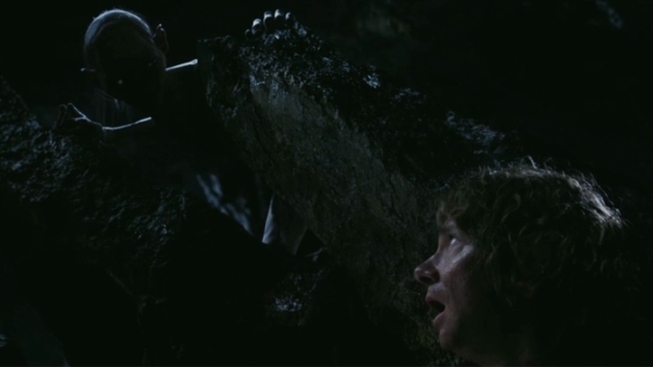 During the journey, Bilbo happens upon a certain piece of jewelry that has some significance or other. Which also means that Bilbo has his first meeting with the ring's current owner - a little creature you may remember named Smeagol/Gollum. He accuses Bilbo of stealing the ring from him, which is a grudge he ends up carrying for quite a long time. Just hearing that voice again - "Bagginnssssss..." - is enough to give us the willies...and have us counting the days until NEXT Christmas. "The Hobbit: An Unexpected Journey" opens everywhere December 14, 2012.